The singer showed up in a white suit with silver embellishments, studded slouchy leather boots and mirrored statement glasses. Rebel surprised the crowd when he turned his jacket inside out to reveal a red-white-and-blue design emblazoned with the words "Keep America Great!," "Trump" and "2020" in support of President Donald Trump. ET's Sophie Schillaci spoke with Rebel on the red carpet. 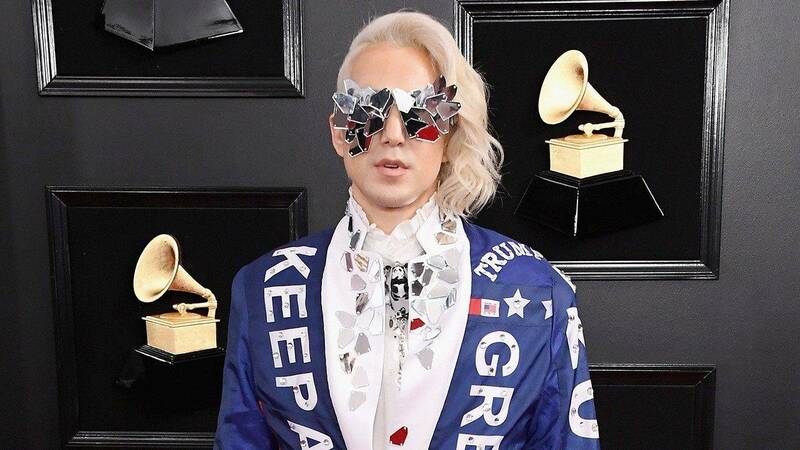 "Well, I’m Ricky Rebel, I have a new album called ‘The New Alpha’ so I wanted to wear something that represented what an alpha is and who an alpha is and I am the new alpha," Rebel explained. " And I’m reflecting millions of Americans out there who voted for Trump. Keep America great. That’s right, baby. We are here. We’re here all around the world, 50 million of us. My name is Ricky Rebel and I’m a reflection of America." This isn't the first time an artist has openly supported President Trump via fashion. In 2017, Princess Joy Villa wore a controversial Make America Great Again dress to the awards. This year, the musician donned a silver ensemble with spiky headpiece, accessorized with a red MAGA bag.